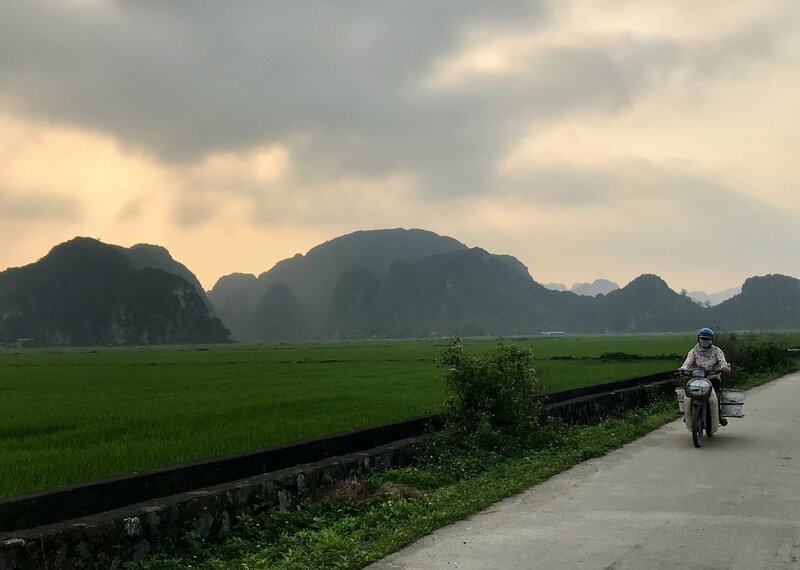 After the mega-stimulation of Hanoi, we arrive at the oasis that is Tam Coc, a village in Northern Vietnam known for its limestone karst formations. Our room has a view of these big boulder-like masses and is set among lush rice fields - a green so pure and pretty. The air here is tropical, fertile, moist. At 96% humidity, our towels and clothes don’t dry easily. In the pond fronting our cabin, surreal purple-pink lilies open at night, then close with the sun. Birds chirp and sing at dawn and the fields are alive, pulsing with whatever life lives there. There are faraway sounds of the town, some music, a faint car-honk but mostly it’s the sounds of nature and it feels welcome. We rent bicycles and explore the tiny town and its rice fields. I am immediately in my happy place. This is my favourite thing to do in these countries – get on a bike and get rural. The weather is perfect, the skinny paths quiet, the views spectacular. Dragonflies hover about peacefully. The gentle breeze is heaven. We discover a temple built into a cave, the air around it perfumed by incense. 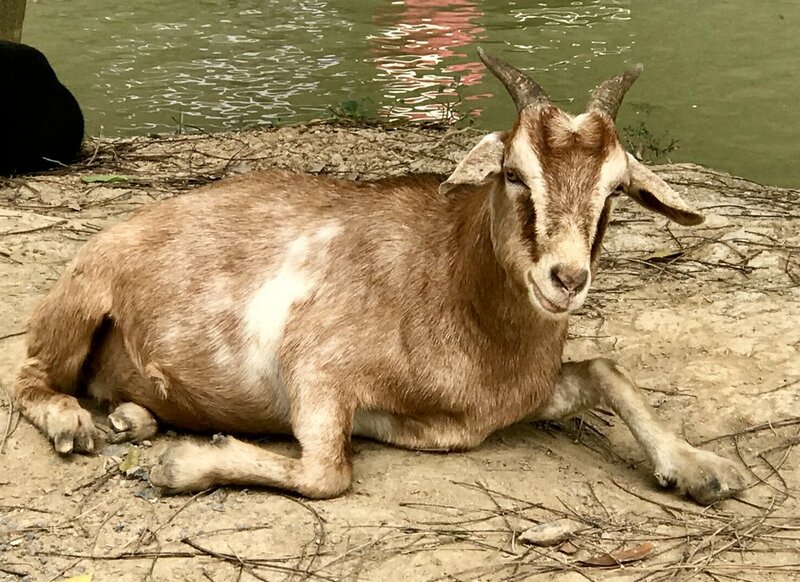 We stumble upon an overgrown graveyard frequented by goats. A cow and her calf block the dirt path back and we wait. We see a serene herder nudging her goats along, an old man watching over his grazing bulls. Mothers riding scooters with their babies, herbs laid out to dry, women crouching with their noodle soups, bats swooping at dusk. Barbers cutting hair in florescent-lit rooms that open to the street. An elderly lady hobbling to her small garden, watering can in hand. This is life lived outdoors – the neighbourhoods bright with activity. The home-stay family are smiley and generous, as were our hosts in Hanoi. It seems to be a trend to give free stuff. Here, they bring us plate after plate of cut-up pineapple. At the last home-stay, they treated all the guests to a homemade feast with wine, which is expensive here. Last night there was a big spider in our room, not of the kind we see in Canada. Our main hostess came with her mother and her 5-year old nephew – all of them in our room to get the spider out. Alas, it had scurried away, hopefully far away. The Vietnamese in general are extremely friendly. We bicycle down a local street and everyone waves, kids hi-five, shout ‘hello!’ and old folks give big smiles. I can’t get over how nice they are to us foreigners – it’s like they have no bad feelings whatsoever. They embrace our presence and attempt to connect with us as fellow humans. Even without language in common, they find a way and they’re not shy. Everyone here rides bikes and no one locks them, which I love. There’s lots of kids riding around and they look like they’re having a lot more fun than kids at home on their phones. This town has a certain innocence. It’s not large enough to be impersonal and its setting in nature makes it feel unspoiled. The main tourist activity in Tam Coc is a ride on the waterways through the karst caves. A local rower takes you out on a sampan, a metal boat which they row with their feet. We rent a motorbike one day and find a remote riverside embankment to launch from. It ends up being a good choice – we have the river all to ourselves, our rower is sweet with his three English words (‘photo’, ‘bat’, ‘tip’) and the tour costs less than half the one in town, with its infrastructure and tourist hordes. We wind slowly down the tranquil river and through 3 caves, dark and cool. Our man shines a flashlight in the caves so we can see their stalactites and structure, the bats on the ceiling. 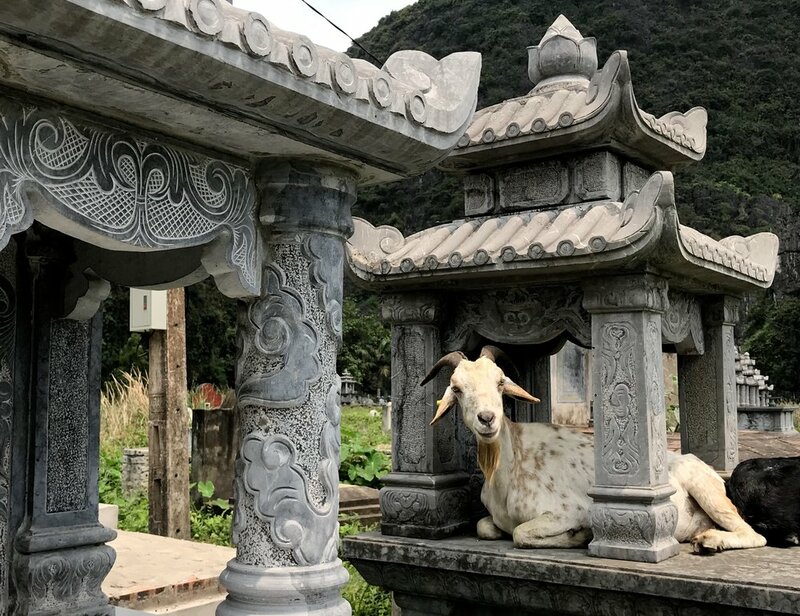 In the afternoon we ride to a complex of ancient temples built into caves, surrounded by fragrant frangipani, squashed fallen figs, goats on rocks that munch on leaves. We get ripped off again with a typical parking scam where we are rush-ushered into a roofed corridor and then asked to pay for parking. As soon as we’ve paid and walk out, we see we could have parked anywhere along the road. The Vietnamese have a reputation for taking advantage of foreigners and we have encountered that behavior several times. It’s frustrating and bewildering – a fierce contrast to the sincerity and kindness we’ve most often experienced. 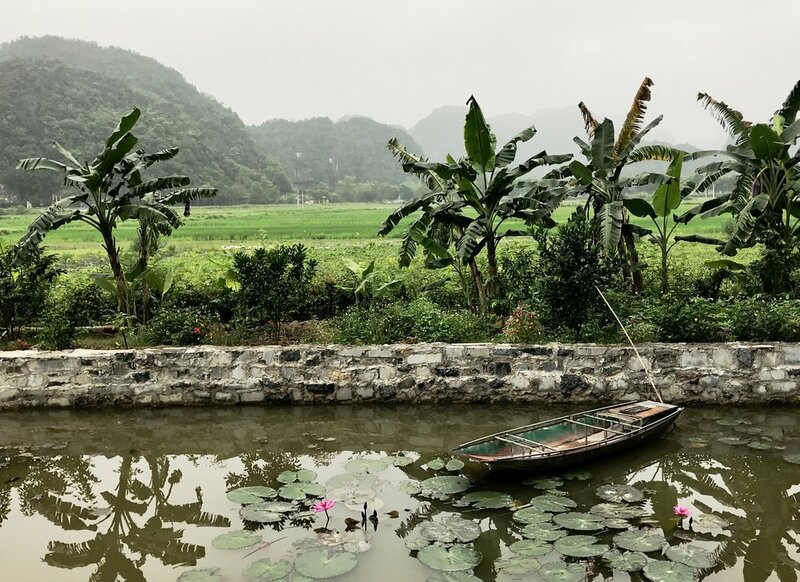 Vietnam, you’ve a complex soul – one I have not yet figured out.